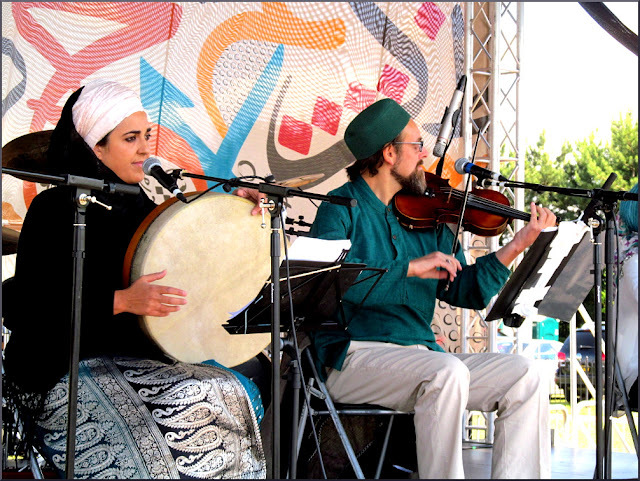 That header photo shows the British Muslim musician Ali Keeler playing with his Al Firdaus Ensemble. The status of music in Islam - forbidden or permissible - is frequently discussed and almost as frequently misunderstood. So I thought it useful to share an extract from an unpublished memoir by Ian Whiteman who was multi-instrumentalist for the mod band The Action and the Sufi-influenced cult psychedelic folk rock band Mighty Baby in the 1960s. Ian went on to make what is, to use a tired and devalued label, an inexplicably neglected masterpiece, the one-off album If Man But Knew by the Habibiyya. In 1971 Ian converted to Islam and became a member of the celebrated Bristol Gardens/Wood Dalling Sufi zawiya founded by the controversial Abdalqadir as-Sufi who later wrote an Islamic interpretation of Wagner's music. After converting to Islam Ian Whiteman took the name Abdallateef and as Abdallateef Whiteman has established a considerable reputation in the Muslim world as a graphic designer. He now lives in Andalusia where together with Ali Keeler and other local musicians he contributes to recording of Islamic sacred music such as the Rawdat al-Shuhuda’ which I praised recently. In 1994 I was invited to participate in a symposium at the Royal College of Music in London, on the subject “Music in Islam: Permissible or Forbidden”. Two of the speakers were pro music and two hard line against, with myself in the middle trying to have an open mind, and not really knowing much about it either, other than that I knew what I liked and what I didn’t. Music had played an enormously positive part in my life and no big bearded imam was going to tell me otherwise, but I also knew the dangers of music having seen the music business in tooth and claw. We had on the panel one bearded Imam who spoke very much against it and I couldn’t see much light in what he was saying but he did speak a lot about the Fire. His speech had a palpably depressing effect on the symposium. It was just a rant citing the prophetic tradition about how music when accompanied by drinking and fornication was not permissible. But I knew enough to know that traditions can be very misleading and taken out of context can be made to mean almost the opposite of what they appear. The other speaker, who was attacking music was an English convert who had been a musician at one time also spoke about sinister pop recordings which if played backwards spelled out evil incantations. Those who spoke in defense of music quoted Al-Ghazali and declared therefore its permissibility. There are of course prophetic traditions which seem to defend music in principle as well but I won’t go into that. It is certainly not even mentioned in the Qur’an, the highest legal authority, so on a scale of seriousness it is not even up there with even minor legal infractions which are mentioned in the Qur’an. The truth is that to most scholars it’s not even important – just a matter of taste. My belief was that music in the company of people seeking spiritual elevation or enjoining good was therefore not only acceptable but a virtue. Music was a passive force which could be used for whatever you wished whether good or bad. I knew the dangers of music, the most obvious being just bad music. It would be like saying speech was forbidden because some people used it profanely. This literalism is deep in the mind set of some people, some scholars included, and is not unconnected to some of the serious problems that beset Muslims and the general public in the 21st century. When a young man untrained in Islamic sciences, with resentments and grudges, gets hold of a book of traditions translated into English he will make enormous presumptions and errors. It has been likened to a man doing brain surgery only having read an article on the Internet. It’s dangerous for everyone concerned and in the case of Islam, lethal. Ali Keeler who sings with Ian Whiteman and others on the Rawdat al-Shuhuda’ recording is a classically trained violinist and my 2015 interview with him attracted considerable attention. Ali shares Ian Whitman's belief that music in the right context is not only acceptable but a virtue, and like Ian he believes that the definition of 'right context' must be flexible to connect with the zeitgeist. 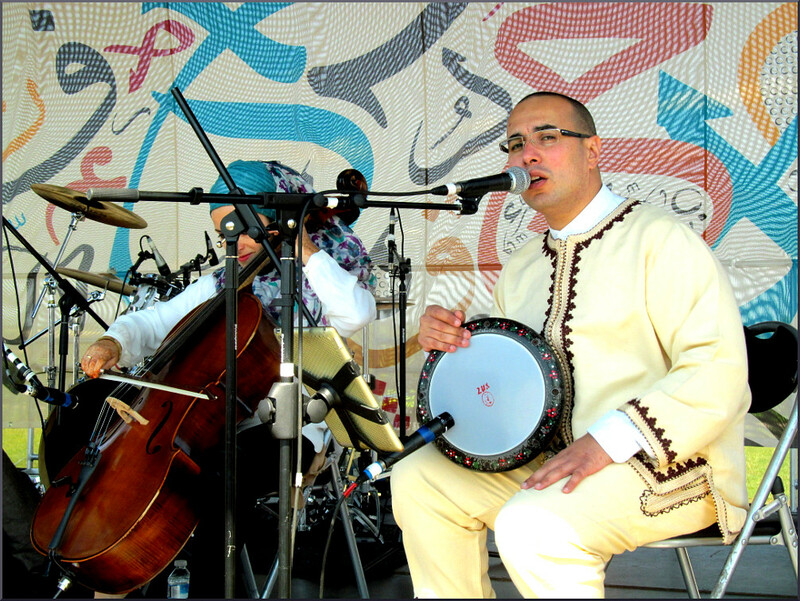 As well as contributing to recordings of sacred Islamic music and being a highly respected exponent of tajwid, the art of Quran recitation, Ali actively explores wider musical contexts. In the 1990s he played on two of the albums by the trip hop group Archive and much more recently he has developed a unique and globally accessible brand of Celtic-tinged Andalusian Sufi music with his Al Firdaus Ensemble. In this his violin and voice is joined by the Spanish cellist Salma Vives, and from Morocco qanun player Yusuf Mezghildi and percussionist Omar Benlamlih; the two accompanying photos taken by me at an Al Firdaus gig show the four musicians, and one of their Sufi musical earworms can be sampled below. 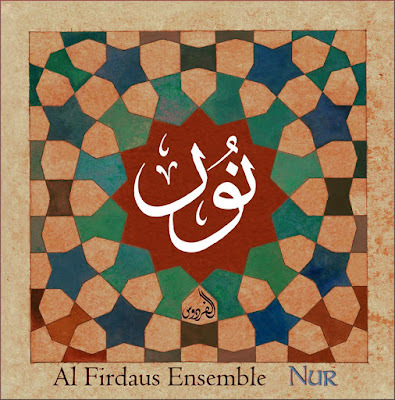 Safa, the first album from Al Firdaus Ensemble has remained high on my playlist for months and now it has been joined by their second album Nur - which translates from Arabic as 'The Light'. The new album delivers more of Al Firdaus' catchy and unique brand of Celtic-tinged Sufism, but with new more commercial and upbeat sound that is suffused with the sonic equivalent of Andalusian sunshine. Nur is available as a download from Amazon and iTunes and a taster video is below. It is very easy to dismiss Ali Keeler's music and my frequent posts about non-Western music as multicultural hot button fodder that is subservient to the pseudo events which dominate Western culture. But such an attitude is foolish and myopic. My interview with Ali Keeler ranks as the fourth most widely read in this blog's twelve year history. Contributing to this was a tweet by the British-Iranian singer/composer Sami Yusuf. Now Sami Yusuf's name may not mean much to those steeped in the Western classical tradition, but he is a very big property in global markets. To illustrate this, Alex Ross has 106,000 Twitter followers, Sami Yusuf has 769,000. Those who chant the mantra that Western classical music needs new markets should note that Shelina Janmohamed's recent book Generation M: Young Muslims Changing the World points out that the global Muslim population is growing more than twice as quickly as overall world population growth. Of 11 countries forecast to join the elite club of economic superpowers this century, six have a dominant Muslim majority and two substantial Muslim minorities. Two-thirds of Muslims are under the age of 30, representing a huge and rapidly growing market. And those who prefer humanitarian to commercial ideals should note that Al Firdaus have taken their multi-cultural music to countries as diverse as Indonesia and the United States, with a Washington Post reviewer writing "Their music is far from political. It’s all about beauty and faith and peace and devotion..."
I am grateful to Ian Whiteman for making the manuscript of his unpublished memoir Average Whiteman available to me. My copy of Nur was purchased via the the LaunchGood crowdfunding platform. Any copyrighted material is included as "fair use" for critical analysis only, and will be removed at the request of copyright owner(s). Also on Facebook and Twitter.